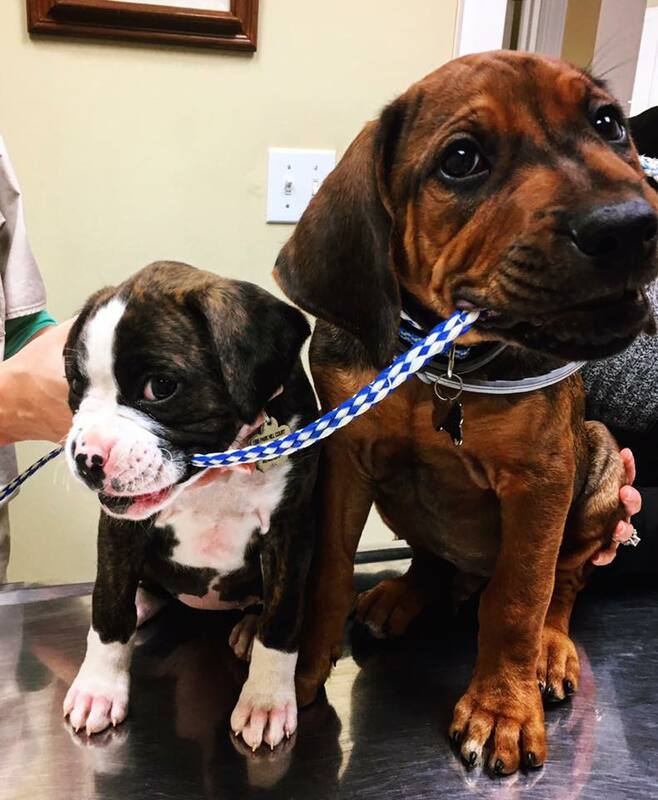 Getting a new puppy is an incredibly exciting time, but it is also normal to feel a little overwhelmed! Puppies demand a lot of attention between more frequent meals, house-training, crate-training, and socialization, not to mention their curious personalities that can get them into a lot of trouble! 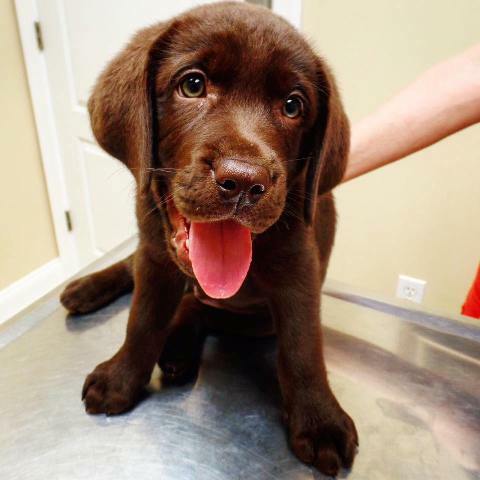 It is a good idea to bring your new puppy into the vet shortly after they come home, as it is important to make sure that they are in good health, not to mention that we typically start vaccinations around 8 weeks of age. We will be seeing a lot of you and your new puppy in their first few months of life, so feel free to ask us any questions or concerns you may have, and remember we are also always available by phone if you happen to think of any questions later on! DA2PP: Core vaccine given at 8, 12, and 16 weeks. Usually called the "distemper shot," this combo vaccine actually covers for not only distemper, but also adenovirus-2, parvovirus and parainfluenza. This is a very important vaccine and is considered a requirement for all dogs. We boost this vaccine at 1 year, then every 3 years thereafter. Rabies: Core vaccine given at 12-16 weeks. Rabies is a public health concern and this vaccine is required by state law. We boost this vaccine at 1 year, then every 3 years thereafter. 4-way Lepto: Non-core vaccine given at 8 weeks, then booster 3-4 weeks later. The distemper vaccine we carry usually is a lepto combo. Lepto is a nasty bacterial disease transmitted through the urine of wild animals and can cause serious liver and/or kidney damage. We generally recommend that all dogs in our area receive this vaccine. This vaccine is boosted annually. Lyme: Non-core vaccine given starting at 9 weeks, then boosted 3-4 weeks later. Lyme disease is very prevalent in our area, so we do generally always recommend this vaccine. Tick prevention via flea/tick preventatives is the best way to protect your dog from lyme disease, but if a tick were to attach, this vaccine serves as a second-line of defense. This vaccine is boosted annually. Bordetella/Parainfluenza: Non-core vaccine given starting at 8 weeks. We usually give this as nose-drops but can also be given via injection. This is the "kennel-cough" vaccine and we recommend this vaccine for dogs that are going to be in contact with others, especially those that go to dog parks, kennels, or grooming facilities. Keep in mind that kennel-cough has several different components, including viral components that this vaccine may not be able to prevent, but we still recommend it for high-risk dogs; think of it like the flu shot for people. This vaccine is booster every 6-12 months depending on your dog's risk. Heartworm and flea/tick prevention is a very important aspect of being a dog owner. Fleas are not only a huge nuisance, but dogs are very sensitive to their bites, and may even lick/scratch their skin raw when they have fleas. If you area suspcious of fleas, look for little black dots that look like pepper; this is called flea dirt, and is actually the digested blood that the fleas pass. The best area to look is on the rump right by the dog's tail, as it is difficult for them to reach this area. Ticks can carry a variety of diseases, the most notable being Lyme's disease, but we can also see diseases such as Anaplasmosis and Erhlichiosis. Heartworms are transmitted via misquitoes and can cause serious, life-threatening heart disease in unprotected animals. We have a variety of heartworm and flea/tick products to choose from. 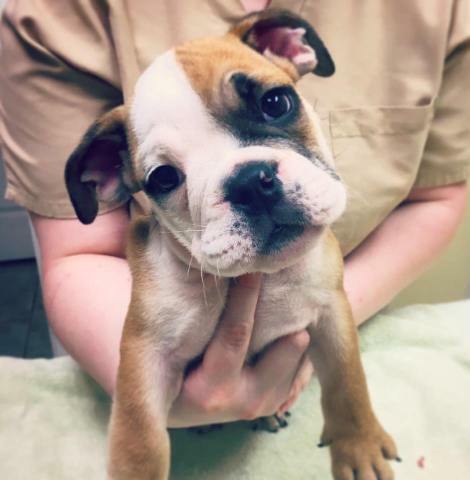 Most puppies will receive single doses each month, as these preventatives are weight-based, and your puppy will be growing dramatically over the next year! We offer chewable, topical, and collar-based flea/tick products. The chewables and topicals are monthly products, and the collar is good for 8 months. Heartworm prevention for puppies is generally a monthly chewable, but once they reach their adult weight, we also offer an injection that lasts 6 months. Please feel free to ask us any questions you may have about these products so that we can help you decide which preventatives are right for you! We generally recommend to spay female dogs between 4-6 months of age; we usually perform this procedure at 16 weeks when their last puppy shot is due to make it convenient for owners. Female dogs generally go into their first heat cycle around 6 months of age. After their first heat cycle, the uterus becomes larger, making it a more difficult surgery, so we prefer to do this procedure before that occurs. The other reason is that the more heat cycles a dog goes through, the more prone she is to developing mammary (breast) cancer later in life. Spaying your dog also ensures that she is not at risk of ever developing ovarian or uterine cancer, and it also prevents a life-threatening disease call pyometra, an infection that can occur at any age, but most likely in middle-aged, intact female dogs. If your dog develops a pyometra, which is an infection in the uterus, she can become very sick, and we then have to remove the uterus via surgery. The age at which we recommend neutering your dog depends largely on breed. Due to recent studies, we are now recommending that larger breed dogs, such as labradors, retrievers, or shepherds, and especially giant breed dogs, such as mastiffs or great danes, get neutered around 1 - 1.5 years old. We are making this recommendation because there is a correlation between neutering later in life and improved joint health in these breeds. Neutering can help with undesirable behaviors and prevents testicular cancer as well as certain prostastic and urinary issues later in life. Please be aware that your dog will gain weight more easily once they have been neutered. We ask that your pet is fasted (no food) after 11pm the night before, and should not have any breakfast. They can still have water. Surgery drop-off times are usually around 7:30-8:00 AM and the surgery will be completed that morning. Pre-anesthetic bloodwork is recommended to ensure your pet is healthy prior to surgery and can be done the morning of. 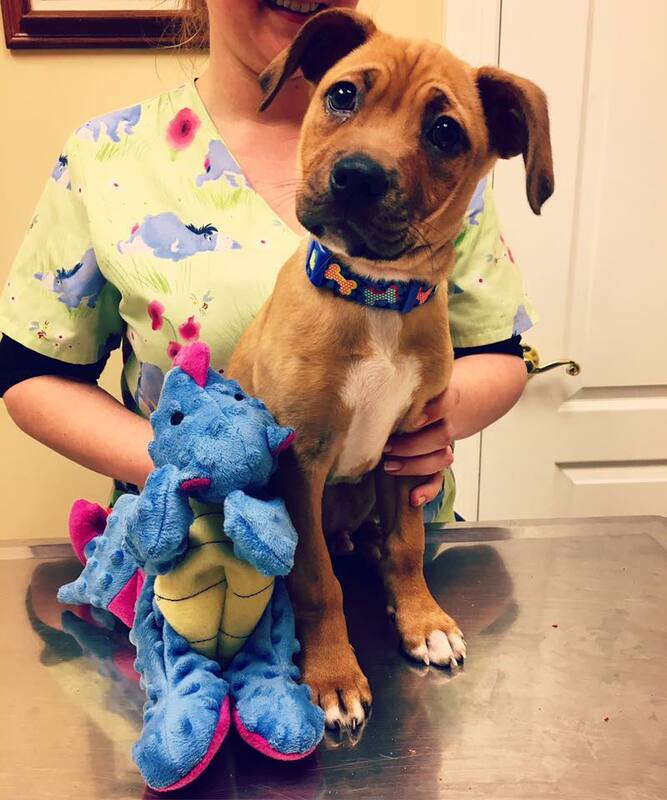 We place an IV catheter to induce anesthesia smoothly, administer warm fluids to your puppy during surgery, and it also serves as an access point if any emergency drugs need to be administered. After surgery, each puppy is monitored until they are awake, and we will offer them breakfast. 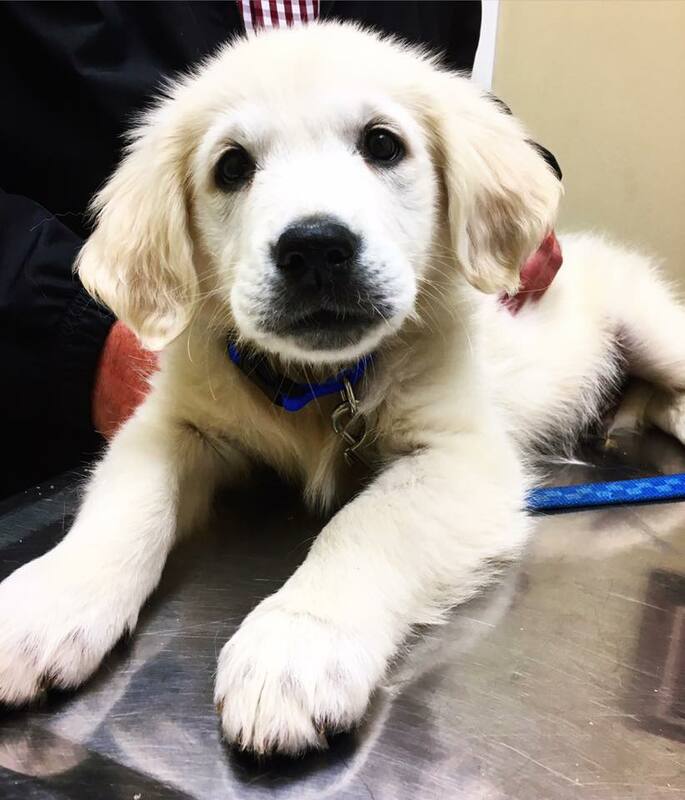 Most puppies are ready to go home by late morning or early afternoon, but we will take care of your pet until it is most convenient for you to pick-up that day. We do try to call once your pet is recovered, but if we do happen to have a busy day, please do not be alarmed if you do not receive a phone call until early afternoon. Your pet may still be a little sleepy the day of surgery, but most dogs are almost back to normal the day after. All puppies will be sent home with pain medication and instructions on their administration. Spays are sent home with a belly bandage that we like to check and replace about 2-4 days after surgery, and as needed thereafter. All routine re-checks are free of charge. Some dogs may need a collar if they are chewing at the bandage excessively. Neuters are closed with sutures that go under the skin and do not need a bandage, but some dogs may need collars if they are trying to lick or bite the surgery site. 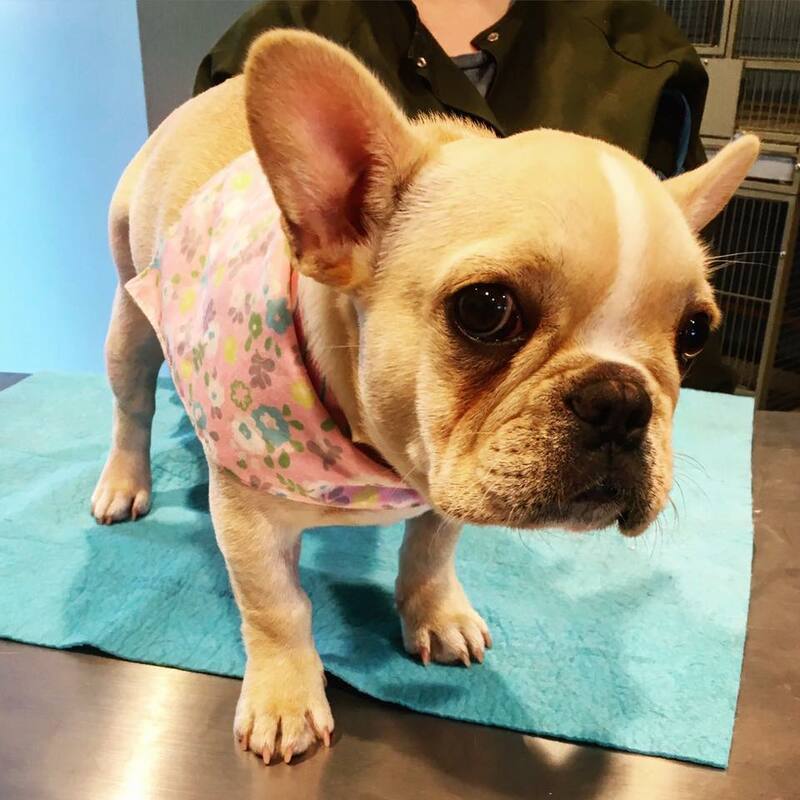 It is very important that your puppy does not lick or bite the surgery site, as this can cause the stitches to come undone and compromise the healing tissue. It is preferable to keep your puppy calm and quiet (easier said than done, we know!) and try to keep them from rough play over the first week. Please call us if you notice any discharge, excessive redness or swelling, and if your puppy seems very painful around the surgery site. Neuters do not need to come back in for suture removal, as the surgery site is closed with absorbable sutures under the skin. Spays will need suture removal about 12-14 days after surgery. If you have any further questions about your puppy's spay/neuter, please do not hesitate to contact us!